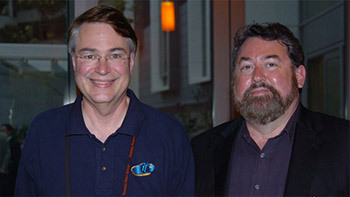 Calit2 director Larry Smarr (left) and INVNT/IP founder Mark Anderson will co-chair the March 13 workshop on innovation and intellectual property. Innovation is now the driving force of the global economy and the intellectual property (IP) which results drives wealth creation in companies, economic sectors, and countries. So what can universities and other public institutions do to turn innovations into IP and to protect that IP so that it generates future jobs for the U.S. economy? That’s one of the fundamental questions to be addressed on Thursday, March 13 at the University of California, San Diego in a workshop on “The Growing Value of Innovation & Intellectual Property as Drivers of the Global Economy.” The meeting – which is open to the public but registration required at the workshop website – is organized by the California Institute for Telecommunications and Information Technology (Calit2) and the Inventing Nations vs. Nation-sponsored Theft of IP (INVNT/IP) Global Consortium. The workshop is the first held by INVNT/IP (pronounced invent-I-P) on a university campus, after extensive prior interactions with large corporations and international policymakers. INVNT/IP was established in 2011 by the Strategic News Service (SNS), after a lengthy study of nation-state business models that rely heavily on the theft of IP. Anderson, a long-time member of Calit2’s Advisory Board, recently invited Calit2’s Smarr to join the INVNT/IP Advisory Board, and the two will co-chair the March 13 workshop in the Qualcomm Institute, the UC San Diego division of Calit2 (the other division is at UC Irvine). Prior to the afternoon workshop, Calit2 is holding meetings with UC San Diego faculty from the three campus units that are co-sponsoring the event: the Rady School of Management, School of International Relations and Pacific Studies (IR/PS), and Jacobs School of Engineering. The morning meetings will focus on ways for the three schools to enhance academic research into the broad issues related to the growing role of innovation leading to the creation and transfer of IP in the global economy. After the sessions on approaches to IP creation and protection at the regional and university levels, the final panel will delve into “How Wealth Is Created by the Invention and Protection of Intellectual Property.” Moderated by Bruce Bigelow, San Diego editor of Xconomy (the workshop’s media sponsor), the session will explore the legal and regulatory environment facing technology companies. Attendees will hear from David Titus, President of the San Diego Venture Group (which represents the growing venture-capital community in the region), and representatives from local, IP-based companies. INVNT/IP boasts members including some of the top technology companies in the world and its Global Network includes cabinet-level policymakers in the U.S., Australia, the U.K. and much of the European Union.